Bird Tape is made from flashy iridescent material that is used to scare away unwanted birds. Together with the movement and crinkling sound of the tape, the reflective colors and shimmering surface scare birds away from any area where they are unwanted. Bird tape can be used in a variety of applications by lining home patios, fences, trees and garden trellises with the holographic strips. As a visual deterrent that birds find disorienting and irritating, the tape provides a very economic way to startle and scare away birds. 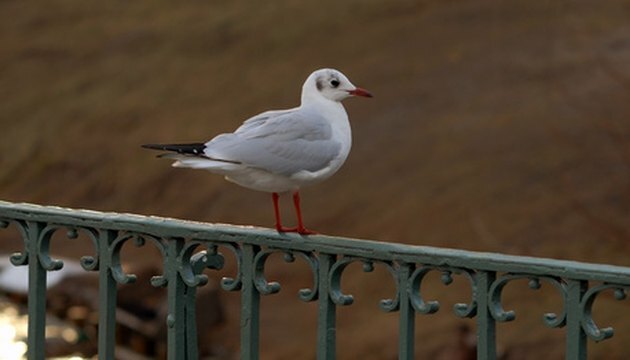 Unwanted birds often perch atop fences and posts near gardens or parks. Purchase enough bird tape to cover the full length of the area where you want to deter birds. Your bird tape can line the top of a backyard fence, the rail of an outdoor patio, or the extend along the full length of your garden. Compare brands and pricing to find the best product solution for your situation. Bird tape is available from different manufacturers in a variety of names, including Irri-tape or Flash tape. The tapes come in a variety of metallic colors with a holographic, silver-coated surface. Fasten the tape to a tall post or tree near your crops, garden or outdoor seating area. Bird tape can be used to deter pesky birds near a variety of outdoor plants or open recreational areas. Birds can be scared away from backyard patios, balconies, gazebos, swimming pools, boats or parks. They can also be kept away from fruits or flowers. Once you have determined the area where you would like to install the tape, search for high trees or existing structures where you can attach and hang the bird tape. Install garden trellises or posts along crops or plants where there are no existing fences or trees to hang your bird tape from. To protect fruits and vegetables, try installing the bird tape just before the crop begins to ripen. Drive stakes into the ground along garden rows to nail your bird tape along the produce. Allow the bird tape to flutter in the breeze without touching the ground or the plants. Installing the tape among the plants is most effective for low crops like strawberries; tape that is strung above the plants may not be distracting enough to deter birds from flying under the tape to the plants below. Prevent birds from landing on tall light posts or patios, by attaching the tape directly to the existing posts. Use mounting brackets included with your bird tape to hang along wooden structures or windows. Cut each strip to a length of at least 1-2 feet before hanging. For large open areas, long strips that are 6-8 feet in length can be fastened to the top of any tall tree or post. Monitor your tape to ensure that it holds tightly and does not break. Tape may need to be replaced after 6-8 weeks after the reflective color has faded and the tape no longer crinkles in the wind. Marissa Abernathy began writing professionally in 2007 on parenting, travel, electronics and technology. She has contributed to the "Norfolk Daily News" and to nonprofit publications of Northwestern Publishing House. As a writer for a web development company, she has provided content for hundreds of resort websites. Abernathy has a dual Bachelor of Arts in art and communicative arts from Wisconsin Lutheran College.